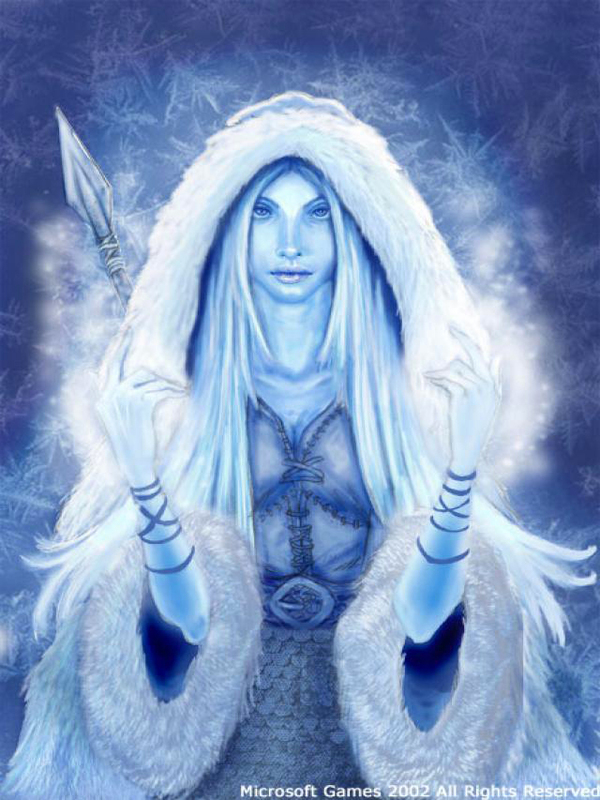 Skaði is the formidable daughter of the storm jötunn Þjazi. She is the goddess of the Winter season, winter storms, snow, ice, hunting, skiing, and archery. She is attested in the Poetic Edda, the Prose Edda, in Heimskringla, and in the works of the skaldic poets. The name Skaði may have ties to the origin of the name Scandinavia, and there are many place names throughout Scandinavia, especially Sweden, which relate to her. We are introduced to Skaði as she barges into Ásgard, marches up to the assembly of the gods, throws off all her armour, and demands compensation for the murder of her father. Taken aback at her brazen courage, the gods confer and decide her request is just. Loki had tricked Þjazi into kidnapping the goddess Iðunn, and in winning her back, the mighty giant was slain, leaving his only heir, Skaði in charge of his domain. Skaði’s reparations come in three parts. The first is for Óðin to place the eyes of her father in the night sky as two stars. Second, the gods must make her laugh. None succeed until Loki ties his balls to a goat and has a tug-of-war … the scene has the entire pantheon in uproarious laughter, and finally makes the giantess giggle. Third, she refuses to consider anything less than marriage to one of the gods as fair compensation, and the gods agree – but with one condition: she must choose her husband from among the gods by his feet alone. The terms are odd, but Skaði accepts. Her true goal was marriage to the god of beauty, Baldr, and she figured that it would be easy enough to just choose the most beautiful set of feet; however, after making her choice, Skaði looks up to find that she has instead chosen Njörðr, the god of the sea. Oops. Her initial reaction is the typical jötunn reaction – anger. She soon realizes, however, that Njörðr is a kind man, with vast wealth and a respectable realm, and Skaði accepts the match. The marriage takes place with no further argument. The newlyweds spend nine days and nights in Nóatún, Njörðr’s realm, and then nine days and nights in Þrymheimr, Skaði’s hall in the mountains of Jötunheimr. The cold and stormy weather isn’t to the sea god’s liking, and the constant noise from the merchant docks drives the giantess nuts, so they agree to spend time alternating between the two. After this, the sources sometimes conflict, and by “sources” I really mean Snorri’s Heimskringla, in which the divorce of Skaði and Njörðr is described, and wherein Skaði then marries Óðin and has many children by him. Although this is a valid attestation, and Snorri is one of our main sources for lore and we typically enjoy him, this alternate story conflicts with other sources. In other stories, most notably the Poetic Edda, Skaði and Njörðr are still together right up until the twilight of the gods. In the story of Freyr’s courting of Gerð, both father and step-mother express concern over their son’s lingering despondency, and it is Skaði who suggests that Skirnir wrangle some information out of him so that they might be of some help. At the last party of the gods at Ægir’s hall, Skaði and Njörðr appear together again as a couple. Ullr is another god to whom Skaði is often married off by modern Heathens. This is probably because both have very similar characteristics, realms, and associations with Winter, skiing, hunting, and archery – but Ullr is never attested as having a wife, and Skaði’s attested marriage to Njörðr and/or Óðin makes this an unlikely pairing. More likely, they are simply besties, hanging out in the great outdoors where other gods choose not to venture. Skaði’s other great appearance in the lore happens around the subduing and binding of Loki. The giantess had never forgotten how Loki caused the death of her father, and in retribution, she is the one who places the venomous snake above his head, where it is intended to drip poison onto his face for eternity. Skaði is definitely the goddess of independence and self reliance – especially for women. If you are a loner type who loves the outdoors, sports, and hanging around with the guys, then she is probably one of your Ásgardian friends. Skaði has an equality with men that isn’t common in the modern age, and she doesn’t back down when it comes time to getting what’s owed her. All relationships are a constant negotiation and adjustment, and Skaði’s marriage to Njörðr provides another healthy example for humans to follow. Not everyone is made for homemaking and sappy romances. Skaði’s love story is one of compromise and hefty amounts of independence. Both partners spend time in one another’s realms, and also alone doing their own things. Rather than being a cause for doubt and jealousy, this arrangement keeps the couple together and their marriage strong. They are each allowed to focus on personal interests, work, and friends without feeling threatened or abandoned. It is interesting to note that one other relationship among the gods, that of Freya and Odr, is similar, but shows how an unhealthy marriage would look in the pantheon. It appears that two have poor communication skills, while the giantess and the Vanir sea god seem to have chatted things out. Skaði is also part of a symbolic, seasonal relationship. Her husband is a god of prosperity, commerce, and the trade that occurs within a sea harbour. Most sea-fairing vessels wouldn’t have made Winter voyages, due to the ice and storms, and so Skaði represents the closing down of trade for the season and switching to other concerns. Skaði is the inspiration behind Hans Christian Anderson’s Snow Queen, with Gerda and Kay being euhemerised, gender-swapped, child versions of Freyr and Gerð. Eat your heart out Frozen. Skis, bows and arrows, and hunting symbols. Snow, ice, stormy mountain peaks, harsh Winter landscapes. Wild game. Frost. She-wolves , huntresses and female fighters. Colours: white and brown. Vodka. The rune Isa.